Home Tags Posts tagged with "Mubarak trial broadcast ban"
Mubarak’s trial has been adjourned until September 5. Former Egyptian leader, Hosni Mubarak’s trial has been adjourned until next month, but judge says proceedings will no longer be televised. Ahmed Rifaat, the Mubarak’s trial judge said the court would reconvene on September 5 to hear evidence, ruling that the trial, which was being broadcast live by many channels and on big screens outside the court, should not be televised until sentencing. Ahmed Rifaat, the Mubarak’s trial judge said the broadcast ban is in protection of the general interest. Judge Rifaat also ordered that Mubarak‘s trial should be merged with proceedings against his former interior minister, Habib el-Adly, whose trial had already been adjourned until September 5. Hosni Mubarak, 83, who has mostly been confined to hospital since he was toppled by mass protests in February, was wheeled into the Cairo court on a stretcher as the trial resumed on Monday morning. Mubarak appeared into the courtroom in a caged defendants’ box, dressed in a navy blue sports sweater, wearing an intravenous needle implanted in his left hand. His sons, Gamal and Alaa, who face corruption charges, came along with him. Inside the courthouse, lawyers for the relatives of the killed protesters shouted and bickered before the judge arrived in the room, apparently over seats. Hosni Mubarak is charged with conspiring in killing of protesters and abusing his power to amass wealth. [googlead tip=”vertical_mediu” aliniat=”dreapta”] Meanwhile, Mubarak was waiting on the stretcher with hands clasped over his chest. 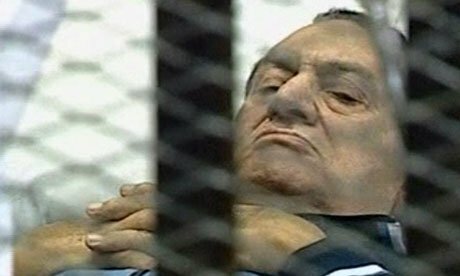 Mubarak, who is charged with conspiring in killing of protesters and abusing his power to amass wealth, answered, “present”, when the judge called his name. Defence lawyers called for hundreds of witnesses to testify in the case, including the head of Egypt’s ruling military council, Field Marshal Mohamed Hussein Tantawi, who was Mubarak’s defence minister for 20 years. Hussein Tantawi’s possible testimony on the former leader’s role in trying to suppress the 18 days uprising, in which about 850 people were killed, is considered critical by many to the outcome of the case. “Tantawi’s testimony would help the court determine whether Mubarak gave orders to interior minister Habib al-Adly to fire at protesters or whether Adly was acting independently,” said one member of the defence team. Lawyers for the families of those killed have demanded Tantawi testify in the trial too. 5,000 riot police officers were deployed along with armoured cars outside the courthouse to keep apart the scores of pro- and anti-Mubarak protesters watching the proceedings of the trial on a giant screen. Egypt’s interior ministry has reported that at least 34 people have been injured outside the police academy where anti and pro-Mubarak protesters clashed. Mubarak made his first court appearance on August 3 and he is the first Arab state’s leader to stand trial in person since popular uprisings spread across the Middle-East. Mubarak faces charges that could carry the death penalty.